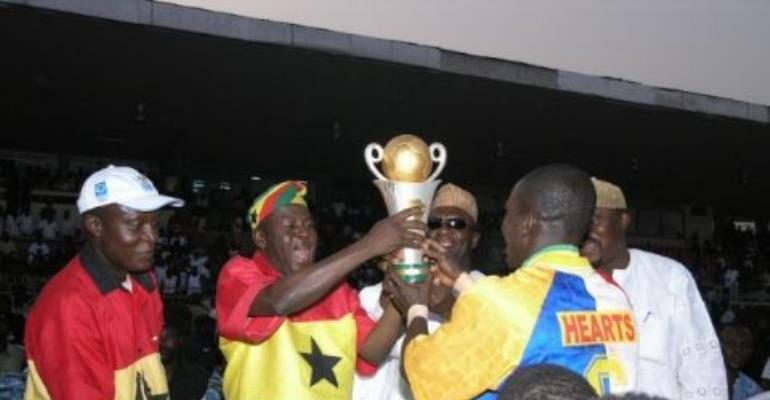 Accra, Feb 1, GNA - The two leg matches of the maiden Confederation Cup finals between Accra Hearts of Oak and Kumasi Asante Kotoko, which incidentally was the first continental trophy contested by clubs from the same country grossed more than 2.2 billion cedis. According to a summarised statement of accounts on the two matches issued by the Ministry of Education, Youth and Sports, the first leg at the Ohene Djan Sports Stadium in Accra grossed 906 million cedis whilst the return leg at the Kumasi Sport Stadium yielded 1.3 billion cedis. The two matches, which were watched by over 82 thousand spectators, will go down into history as one of the highest attended matches in Ghana football. Hearts net share of the amount was almost about 800 million after the deduction of taxes and expenses whilst Kotoko, whose base at Kumasi Sport Stadium base is bigger, took home 1.050 billion cedis. The statement copied to the GNA Sports further revealed that the actual amount to Hearts in terms of gate returns was 383 million whilst the remaining 416 million of the net was from the sale of special raffle tickets. In terms of patronage, whilst the first leg at the Ohene Djan Sport Stadium pulled 35,100 fans, 46,940 supporters watched the return leg at the Kumasi Sport Stadium. The National Sports Council, custodians of the two stadiums also had 95 million cedis being their five percent of gate proceeds, whilst VAT and the National Health Insurance Levy took 235,434 million cedis from the two leg matches. The aggregate scores for the two leg matches was two all after both matches ended one all at the end of regulation time. Hearts however won the Cup in the final tie when they beat Kotoko 8-7 through penalty kicks.